If you are familiar with driving in rural France two of the things you notice as you trundle east out of Antanarivo, (the capital of Madagascar) past paddy fields, small rounded hills and lakes are the kilometre posts on the side of road and the entry and exit signs to villages and towns. They are just the same as they are in France, albeit rather more faded. On closer inspection you also observe that any building of note recalls the architecture of northern or eastern France. And then at breakfast you are always offered pain au chocolat and croissants. The slightly less pleasing reminder of Madagascar’s former colonial power is the obsession with signing bits of paper in hotels after eating or drinking and general form- filling at check in. The railway stations look proud and imposing in that French republican way, and one of the most enjoyable dinners I had on my recent visit was at the Café de la Gare in Tana (short name for the capital as even the locals find the full name too much of a mouthful) – recently transformed into a trendy hot spot. Sadly, there are not too many trains running these days. Well enough of frenchisms. The real draw of this, the fourth largest island in the world, is probably lemurs which are, in certain areas pretty easy to see. 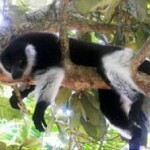 The indri in particular was a highlight. 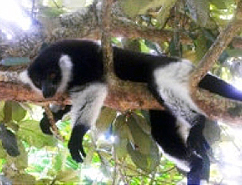 It is the largest of some 70 species of lemur. Indri have an incredibly loud and haunting cry, their calls to other groups resounding across the dense canopy of tropical rain forest in the Andasibe Mantadia (Périnet) National Park where I experienced brilliant sightings. This must rank as one of the most evocative wildlife experiences in the world. The indri is one of the most sluggish to get going in the morning, but once the sun warms up a bit they start foraging for food, and then you may just get to see what acrobatic jumpers they are. As with all primates the young are playful, so family groups can be most engaging to watch. A bit harder to see is the Sifaka lemur and even harder is their only serious predator, the Fossa. This animal can reach up to two metres in length but then half of it is tail so nothing to rival a big cat on the African mainland! An agile beast, looking something like a cross between a dog and a cat, it is the largest carnivore to be seen in Madagascar. Chameleons are in abundant variety on the island. I saw the smallest on earth measuring less than an inch in length in the Montagne d’Ambre in the north. 87% of all wildlife here is peculiar to Madagascar and if you take birds out of the equation that figure rises to a staggering 97%. So if you want to see new species this is the place to visit. Getting around does require some patience, and Air Madagascar seem to start their schedules at 0530, so some early drives to the airport are de rigeur. I actually found it rather fascinating to watch the capital waking up. 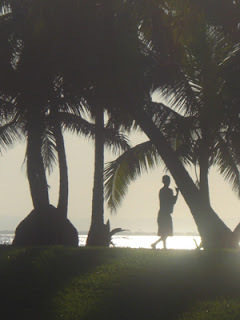 In particular, how many people seem to be running along the road: some were speeding to work but more were simply keeping fit which I thought was a bit keen before dawn had broken. When you want to relax, Madagascar has some stunning turquoise – blue seas to swim in. 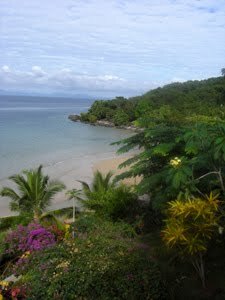 I think my favourite beach place was on the small island of Nosy Komba just south of Nosy Be, a larger, better known and in my view less appealing island. Sailing yachts and catamarans are also available for charter with a skipper and cook for those who want to reach deserted beaches and see life from the ocean waves. 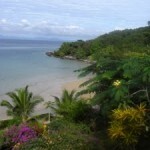 For a wilder, less travelled beach experience I liked Manafiafy in the deep south. With only six rooms the lodge is sensitive to its environment; you can also go canoeing in the lagoon area, spot whales and see lemurs in the forest behind. Its sister camp in the spiny forest to the north is a proper wilderness experience and is run more on our African model. Overall, these two lodges offer a fantastic experience and are highly recommended. Madagascar is a stunningly beautiful island packed with a variety of wildlife, landscape and experience quite unlike anywhere else. A short two week holiday staying at some of these places will cost from about £4,500 per person including flights.